The oldest city on the Maas founded by the Romans and offers many opportunities for a pleasant stay. Times 2000 years back in time and visit the Bonnefantenmuseum. Stroll through streets and squares, walk along the old city walls and gates. Visit the old watermills still in use. The city invites you for a walk on the ramparts of a picnic. Maastricht is also known as a cosmopolitan city with many exclusive shopping and unique shops. Let yourself be pampered in the Burgundian numerous restaurants, cafes and terraces, as Vrijthof or the Onze Lieve Vrouweplein. A cruise on the river or a visit to the marl caves are warm to recommend. Every Saturday antiques and flea market near the railway station. Preuvement, the annual culinary event on Vrijthof. TEFAF unique and world famous annual art fair in the MECC. 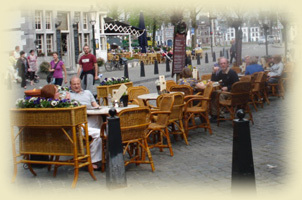 From Hotel Berneau Maastricht is quickly and easily accessible in about 15 minutes by car. The largest and oldest city of Wallonia (French Belgium) is a surprising and vibrant city. You´re away from here where the city with his French influences, but it is so close. Take a walk with a guide and transport you through ancient times. Walk through the many alleys and squares, check out the many impressive churches and buildings. Liege is a great shopping city. The famous Belgian cuisine you can not skip in the numerous restaurants and cafe´s. Possibility from Maastricht to Liege to travel with a boat. Every Friday antiques and flea market. Each Sunday morning the biggest market of Belgium at the Meuse. From Hotel Berneau Liege is quickly and easily accessible, about 15 minutes by car. The ancient city of Charles the Great welcomes you. Discovered 2000 years ago the Romans built this town and several baths. Now you can enjoy the natural thermal sources. Ga a day relax and let your body be pampered in carolus sauna . Visit the cathedral of Charlemagne and stroll through the many shopping streets. 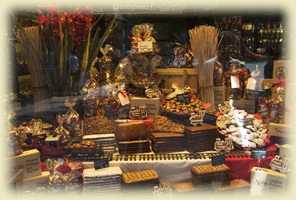 Try the typical Aachener Printen (cakes of brown sugar with chocolate). A city we can warmly recommend. 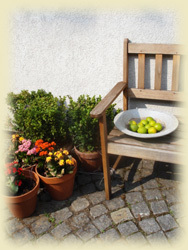 From Hotel Aachen Berneau is quickly and easily accessible, about 20 minutes by car. The old monastery famous for its beer and cheese is certainly worth a visit. Situated in a rolling landscape where the walking is fine (solid walking shoes recommended). 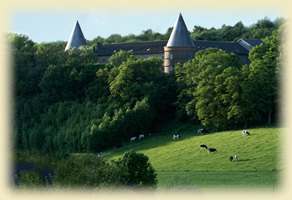 In and around the abbey, you have the opportunity to learn to the typical Belgian cuisine. Walk from Hotel Berneau to the Abbey, about 12 km (single), by typical Belgian villages in the hills and empty roads. Would you spiritual spheres are higher, then a visit to the abbey. Each day, the monks a Gregorian Mass on. From Berneau Hotel is easily accessible abbey, about 15 minutes by car. It is also nice as long distance walk from Hotel Berneau to the abbey, about 26km (single). Located on the Cauberg and the fastest flowing river in the Netherlands "Geul" is the picturesque town of Valkenburg. Here you can stroll through the marl caves or reconstructed coal visits. 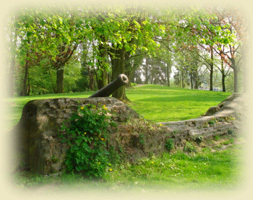 Valkenburg has a unique castle ruins situated on a hill that you see are already far. With many choices in restaurants and cafés Valkenburg aan de Geul is certainly worth a visit. Also visit the thermal bath or the casino. From Hotel Berneau town is easy and fast to reach approximately 15 minutes by car. 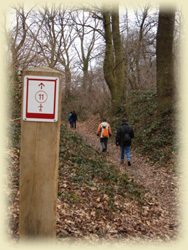 It is a beautiful long-distance walk from Hotel Berneau to Valkenburg, ca 16 km (one way). For the real sports but also for the holiday is near Berneau a unique hiking and cycling paradise. 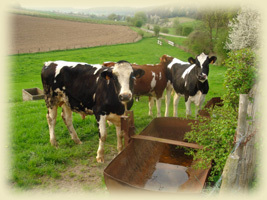 Recommended walks: Land of Herve, the Castle Road, Route Mergelland. Recommended cycling: Orchard Route 80km, 60km Herven wandering through, climbing between Liège and Maastricht 81km enjoy an abbey beer Val-Dieu 52km. Close to the hotel door, the walking and cycling routes identified. In the border region, the beautiful walking and cycling routes through signs indicate. The major route paths GR5 North / Riviera, GR563 Herve indicated by the familiar red / white, yellow / blue.